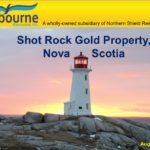 Shot Rock Gold Property – NorthernShield Resources INC.
Seabourne Resources Inc., a wholly-owned subsidiary of Northern Shield Resources, has signed an option agreement with a local prospector to earn an 80% interest on the Shot Rock Property in Nova Scotia. To earn its interest, Seabourne must incur $2 million of exploration expenditures on the property within 4 years and make cash and share payments to the prospector over the same time period. 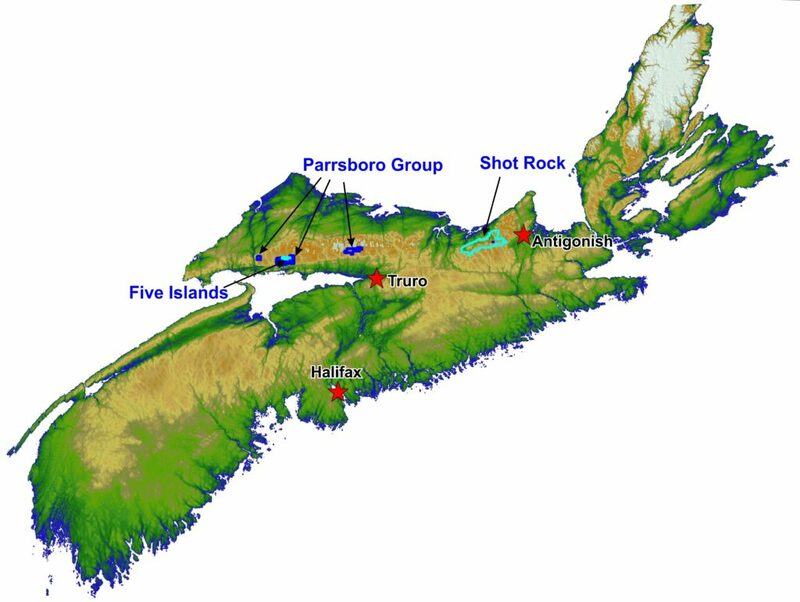 The Shot Rock Property is composed of 1,200 mining claims units staked under the terms of the Mineral Resources Act of Nova Scotia, which represents a total area of 185 square km. 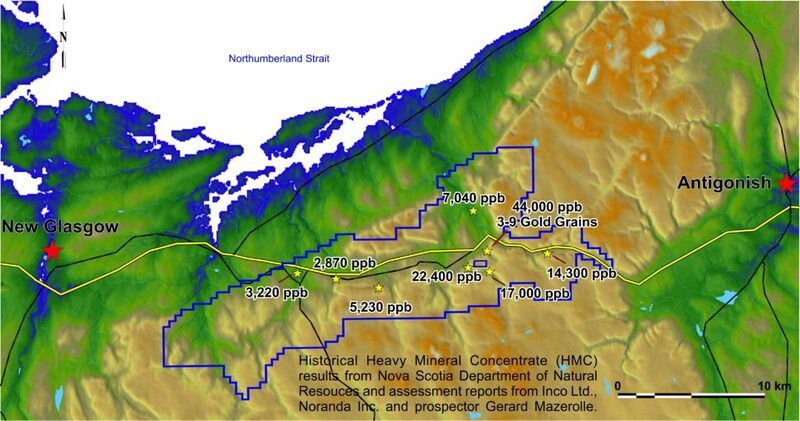 It is located between New Glasgow and Antigonish, and covers an epithermal gold setting of a type not previously recognized in Nova Scotia. Seabourne’s decision to acquire the claims now called the Shot Rock Property was based on the hard work of a local prospector who had spent years diligently compiling data from numerous sources, prospecting old reports in libraries as much as the brooks and mountains, and after self-learning geology, re-interpreting the source of the gold that he was finding in the streams. He pitched his theory on this gold project to Northern Shield at a mining exploration convention in Toronto in 2017. Shortly thereafter, we decided to throw our resources behind him and agreed to explore the project through an Option Agreement. 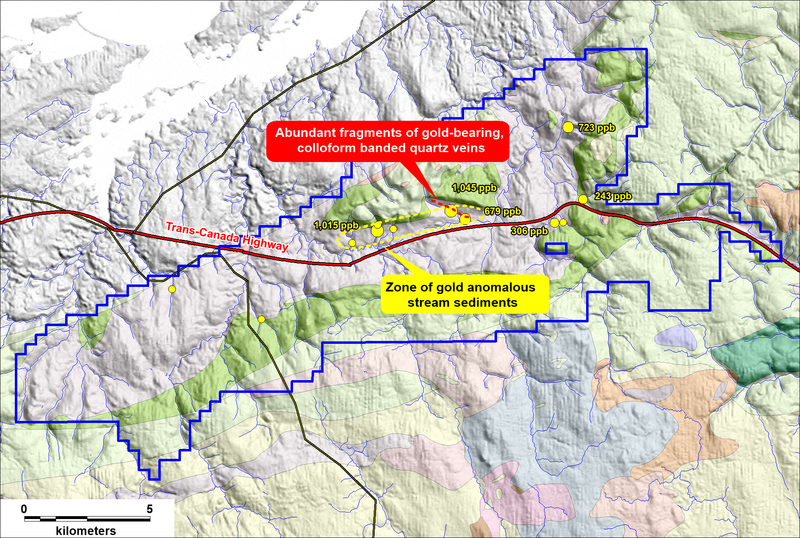 Up to 44,000 ppb Au in historic Heavy Mineral Concentrate samples (sources on map). 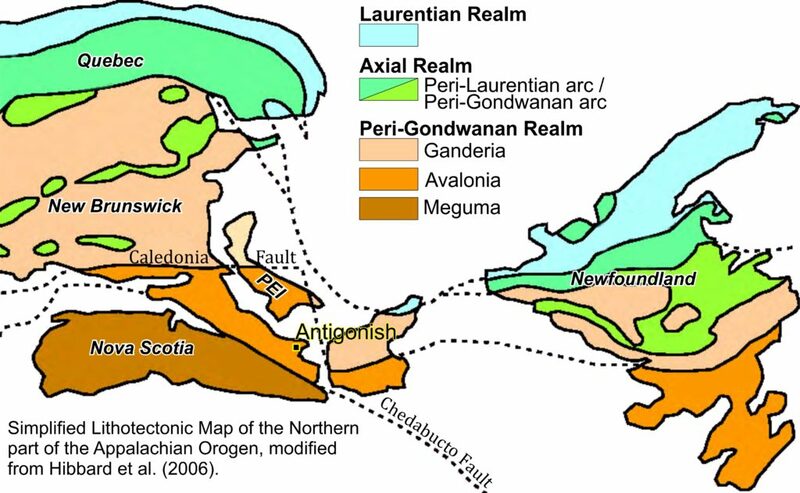 The Shot Rock Property is located in the Antigonish Highlands, along the southern margin of Avalonia, a fault-bounded terrane between the Meguma Terrane to the South and the Ganderia Terrane to the North throughout the northern Appalachian orogen. The following descriptions are mostly based on White (2012) are references therein. The oldest rocks found within the Property are part of the Late Neoproterozoic Georgeville Group, including units from the Keppoch and James River formations. The Keppoch formation is composed mainly of rhyolitic to dacitic tuffs and flows while the James River formation in this area is mostly represented by laminated cherty siltstones and sandstones. 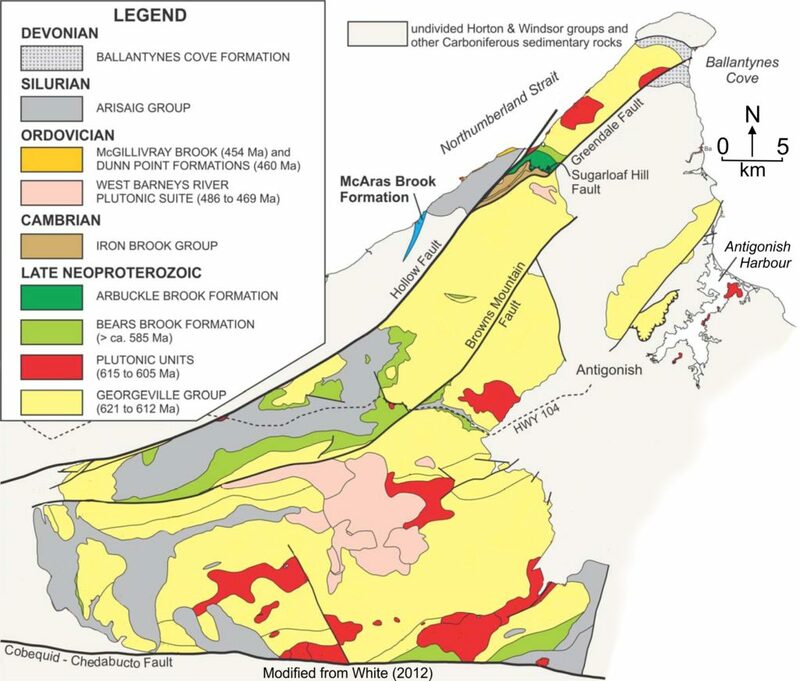 The late Neoproterozoic Bears Brook formation overlies the Georgeville Group formations in what appears to be a somewhat conformable contact, at least within the area of the Property. The rest of the Property is underlain by rocks from the Silurian Arisaig Group composed of shales, mudstone, siltstone and sandstone sequences (some fossiliferous) and red carbonate units and limestone. There are no known volcanic rocks nor sills and dikes associated with the Arisaig Group. The following description is mostly based on a thorough compilation paper by Simmons et al. (2005), in which references to a large number of relevant papers can be found. Epithermal systems have been and continue to be a very important source of gold and even more important source of silver. The typical orebody found in an epithermal system varies in shape, size and grade, and can easily be hidden underneath a blanket of barren alteration or even unaltered volcanic rocks. Deposit-size to district-size range from <10 km2 to 200 km2. 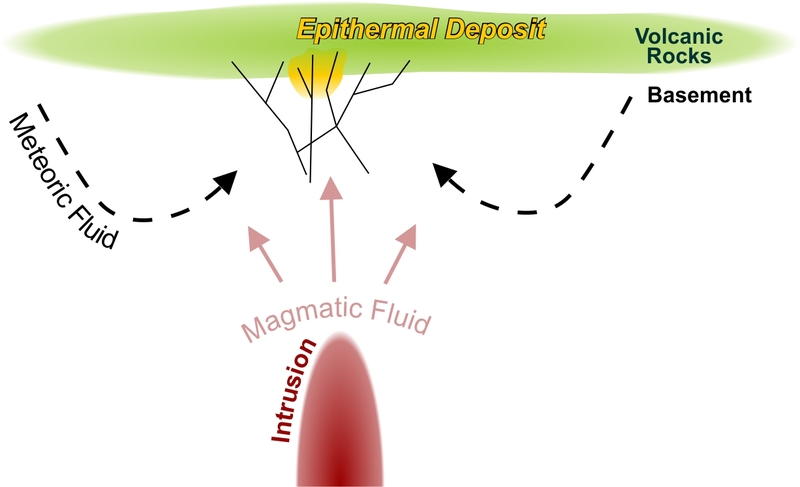 Drilling is crucial in exploring for epithermal deposits because surface features may not be representative of what is at depth. Deposits form in the lower temperature, shallow portion (< 1.5 km depth and < 300° C) of a high temperature hydrothermal system. This type of hydrothermal system most commonly develops in association with magmatic sequences of andesite, dacite and rhyolite of calc-alkaline and alkaline affinity, which are related to volcanic arc at convergent margins, intra-arc, back-arc and postcollisional rift settings. Au-rich deposits (low Ag/Au ratio) are also found in tholeiitic bimodal (basalt-and rhyolite) systems. The mineralization develops in zones of high permeability within the volcanic rocks genetically related to the hydrothermal system and in the older basement rocks below them. Steep dipping veins are generally host to the highest-grade ore. Lower-grade but potentially high tonnage ore can also be found in breccias, coarse clastic rocks and intensely leached rocks. The first is generally preferred because potentially high degree of oxidization of the ore can make the other three methods difficult. Simmons, S.F., White, N.C. and John, D.A., 2005. Geological characteristics of epithermal precious and base metal deposits. Economic Geology 100th Anniversary Volume, pp. 485-522. 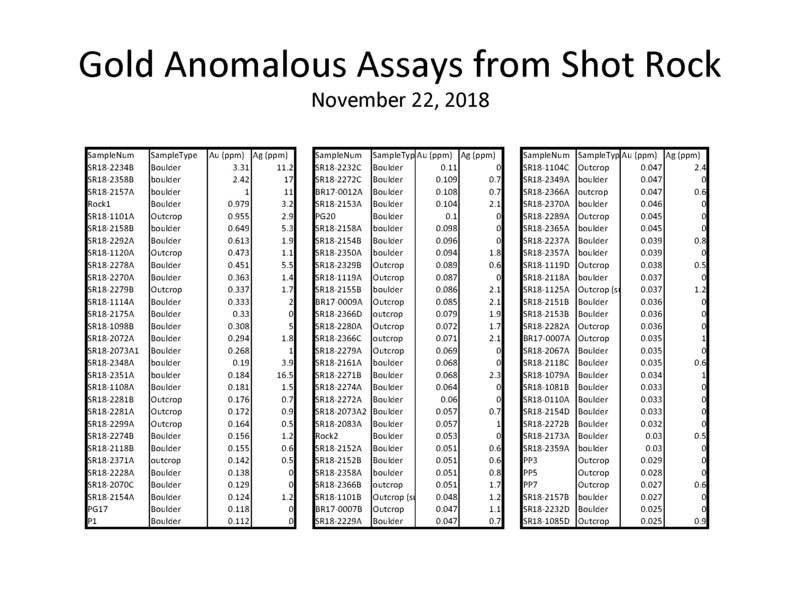 Stream sediment anomaly map showing significant gold values.